Synopsis: A drunken, hard-nosed U.S. Marshal and a Texas Ranger help a stubborn teenager track down her father’s murderer in Indian territory. Did You Know? John Wayne publicly disliked the finished film. He was disappointed in the casting of Kim Darby and got along with neither her nor Robert Duvall on set. Later, when he won the Oscar he told Richard Burton that he felt that he should have won for his performance as Henry VIII in Anne of the Thousand Days. Quotables: LA BOEUF: I only take one step at a time. That’s why I’ve got two feet. There is no sound more repellent than that of people chewing. And True Grit gives us the ear-offending sound of a dozen people chewing at the same time. It sends a shiver of revulsion down my spine, makes my skin crawl, and sets my teeth on edge. 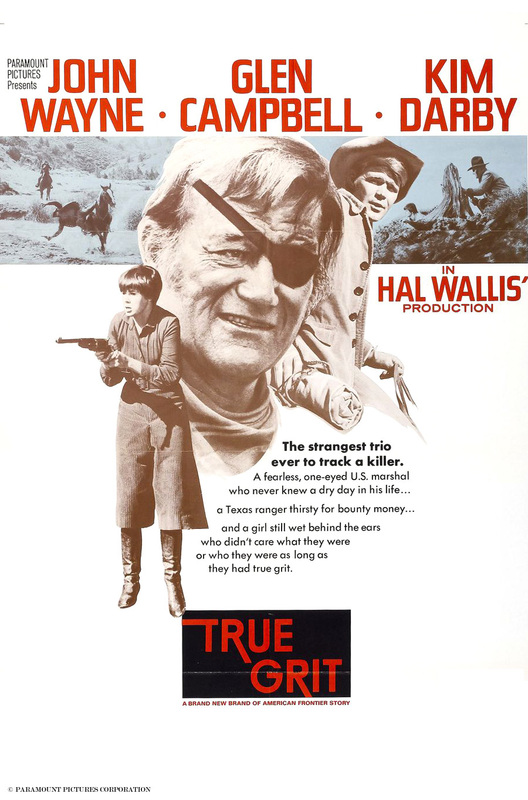 I know I shouldn’t compare the remake to the original, but I personally prefer the Coen Brothers’ True Grit. The screenplay is mostly the same, but the acting is much better in the remake. Hailee Steinfeld gives a much more convincing performance than Kim Darby. And Jeff Bridges’s Rooster Cogburn really has true grit, whereas John Wayne plays the same drawling curmudgeon that he always plays.